Holed up in a BBC bunker [its definitely not glam - the BBC is normally in the basement in the bowels of the Manchester conference centre] I will talking to Alfie and Charlie about the living wage, the increase in the minimum wage and action to tackle low pay generally. There are too many people to thank but chief praise must go to Elaine whose land Epiacum is upon, Alastair for his fascinating insight into the history that is all around you both on the fort and as you walk, and, in particular, Colin Bywater who drew the maps in the new book both Rory and I were given today. It was also a great opportunity to talk at length with Ian Forbes, the chair of the Friends of the North Pennines, who has brought together so many of the people and organisations who have made the North Pennine Walking festival happen. But there is one man who should be singled out for his commitment to Wainwright, and the Pennine journey: David Pitt is the chair of the Pennine Journey Supporters Club. It celebrates and supports the iconic journey taken by the worlds greatest walker, Alfred Wainwright. The book the Pennine Journey accompanied me on my walk of the Pennine Way last year and is a wonderful read, albeit it is affected by the backdrop of 1938, when it was written, and a cold that dogged the great man - and some interesting weather! But it is a testament to AW that when the great man went for this circular stroll from Settle to Hadrian's Wall and Hexham and then back down the Pennines to High Force, North Yorkshire and back to Settle he not only describes geography and nature, but he records history. Most of all it brings out his understanding of remote places and the hills that characterise the Pennines. It is a classic walk and the supporters club have brought the walk back to life with way marking and a true celebration today of all the walk. Massive praise to everyone involved. The route is 247 miles. Much of goes through Northumberland and is a further reason to come to region, and a real boost to the local tourist potential and economy. David's enthusiasm for AW and the Pennine Journey is palpable and I urge you to pick up a copy of his guide to the Pennine Journey. It is a beautiful book, made with much help, and in the true AW style. I will treasure my copy, and consider it a privilege to have finally met David. I bow to only one man as a more enthusiastic walker than me in the House of Commons and that is my friend and neighbour Rory Stewart. It was good today that we could show the north Pennines is a region with its own special identity, without reference to man made boundaries. One iconic moment was when we shook hands across the stream that divides Northumberland and Cumbria. That was a photo! Nearly 100 people came to the Haltwhistle Church Hall coffee morning today and I got the chance to chat to many of them. Potholes and the state of the pavements in Halty featured very strongly, plus a strong view that we are not getting the attention enough of Morpeth. My campaign for improved cycle paths and making cycling safer generally was strongly supported - normally by mums worried about their kids. But most interesting were the multiple comments about the problems on the late night trains. Everyone agreed there was a problem with people on the trains who were drunk, and occasionally abusive. Several identified the problem that were drinkers banned by the Carlisle pub watch going to Newcastle and then returning home drunk. We are still gathering evidence but I will be considering the response from the police and BTP when I get back to London next week. Reflections on Ed Miliband's speech and approach dominated the 5 question and answer sessions I have done with young and old over the last 72 hours. On any interpretation Ed has taken the Labour party firmly to the Left. And to think he had been denying he was Red Ed these last 3 years? There is no need to strain our hearing for the dogs that didn’t bark. All we need to do is set out what Ed actually said. 1. He called for the state intervention to control the prices of the private energy utilities - hello 1970's. 3. He confirmed that the state would prioritise capital investment over deficit reduction - goodbye balancing the books, deficit reduction, and low interest rates, and welcome to greater debts for our children. 5. He announced that reforms to the NHS would be scrapped, condemned efforts to cut immigration, and a rise in taxation. Some of these measures are populist, and playing to his core support, even if they are completely unworkable. But what cannot be contested is that this is a seriously Left-wing agenda from a leader who has chosen to define himself as Left-wing. When Ed Miliband said he planned to bring back socialism it wasn’t a slip of the tongue. We are not in the midst of some great “Red Scare” whipped up by the Right-wing media or Labour’s opponents. Were in the midst of a “Red Scare” that’s being whipped up by the leader of the Labour party. There is no need for the papers to print scare stories about Labour seizing control of private sector companies, or snatching private land. It’s there in black and white in the leader’s speech. "Ed Miliband is taking Labour towards its real role for the first time since the 1979", wrote Labour MP Michael Meacher, glowingly. In fact why be surprised? The real Ed Miliband is finally standing up. Whether people in his party like his new Left-wing stance, or loathe it, it’s too late to be complaining about it now. For those who wanted a genuine debate about what type of choice we have at 2015 it is a lot starker now. I have just spent a week on the road campaigning in Scotland. I will blog in more detail in due course on my findings from the 12 different events, campaigning, dinners and meetings I had from Stonehaven to Argyll and many parts either side, and in between, but the debate issue is fascinating. Alex Salmond will not debate Alastair Darling, the leader of the Better Together campaign. But he's desperate to debate the PM, David Cameron. Why? Because he wants to make this a Scotland v England debate when the reality is that this independence campaign is a decision for Scots to make. I spent the week observing, listening, and making the case that I passionately want to preserve the Union. The debate is between the Independence Scots and the Better Together Scots. That is the issue from which Salmond is running from. He should debate Alastair Darling. The Resolution Foundation has asked Tim Montgomerie, Frances O'Grady, David Skelton and I onto the panel for the Resolution Foundation and TUC debate on "Tackling Low Pay" on Sunday between 6-7 inside the conference zone at Exchange 6. I will be welcoming the increase in the minimum wage, making the case for a living wage and talking about what government and businesses can do to address low pay. Both Tim and Frances are outstanding speakers and there are more key players on the panel like Mary Riddell and Gavin Kelly. It will be a fascinating session. I hope we will also be discussing the wider plans that David Skelton and I are working upon to address blue collar issues more generally. These include action on apprenticeships, education, supporting the unions and giving union members free membership of the Conservative party, if they want to. For my part I see the unions as a key player in addressing low pay. It is not simply about money, although that is fundamental. Of almost more importance is a pragmatic relationship between unions, employers and employees. I will be 15 minutes late as I cannot fail to support the Newcastle University organised fringe next door in Exchange 4-5, starting at 5.30, where we will be examining "Wellbeing in Later Life" with Professor Tom Kirkwood CBE, from the University plus the Minister, David Willetts MP, Norma Cohen from the FT and Dr Lynne Corner. Tom's work is genuinely groundbreaking and addresses a key issue which everyone has to deal with. The Hexham Market is from 9-1.30, and should be followed up with a visit to the Vintage Fair in the Trinity Centre, just up the road from the Market, from 10.30-4.30. This is part organised by the wonderful people at the Hearth in Horsley, and will feature clothes, textiles and fabrics for everyone. If you have time you could also take in the Barrasford Arms Marrow show. It is a great pub, with the best atmosphere, delicious food, and nice people. Worth going along to, even if only to support the Great North Air Ambulance, to which the proceeds rightly go to in Air Ambulance week. Rory Stewart and I are opening the North Pennines Walking festival at Epiacum tomorrow morning. Greatly looking forward to it. Also coming soon is the Haltwhistle Autumn Walking Festival, starting on October 5th and taking in multiple walks over the ensuing days. Book early to avoid disappointment. Returned home from Scotland last night at shortly before midnight but have early meetings this morning with Newcastle College, and Northumbria University, followed by several events this afternoon and am looking forward to the event this evening organised by our wonderful Bardon Mill Branch. The church hall in Haltwhistle is my destination first thing Saturday, and anyone who wants to come and chat or raise any issues national or personal can come along between 9.45-10.45. There is also a great coffee morning! I am then off to Epiacum to help open the North Pennines Walking Festival with my colleague, Rory Stewart, MP. We will be both walking part of the way with locals and enthusiasts. Again please come along - the site at Epiacum is one of most important Roman sites in all of Northern England. Macmillan coffee morning this Friday and Saturday - which one will u go to? Northumberland has dozens of the annual Macmillan coffee mornings to choose from but make sure you go to one over the two days. This is just a selection and Slaley is even stealing a march on the rest by holding an event on Thursday at 10 in the village hall. Make sure you go if you can! It is a great cause. I popped in to Perth Airport to meet Gavin and the pilots and paramedics who run Scotland's charitable air ambulance service. They are doing a great job and have flown 139 missions since their start up barely 4 months ago. They are saving lives, and making a real difference. I am chair of the All Party Group for Air Ambulances in Westminster and it was good to hear their progress and discuss their operating their operating model, as not all AA are the same. The SCAA work together with the 2 preexisting Scottish NHS air Ambulances, which are located in the south and north of Scotland. Having spent the evening before near Ballater, and driven down through the Cairngorms through North Perthshire it was clear that the wonderful landscape was capable of being crossed at least 5 times more quickly by helicopter than by conventional ambulance. The need for helicopters to meet the golden hour post an accident or emergency was clear. I am sure that they will go from strength to strength. I had a brief chat with the team in the control room, but as we were talking the "Batphone" went, and they were back to work. I wish them well and would urge all Scots to support them. Looking forward to todays event on the shores of Loch Lomond. Today I am south of Aberdeen to meet local businessmen, the local MSP and then kncoking on doors before speaking at a dinner at the Marine Hotel in Stonehaven, just south of Aberdeen. Greatly looking forward to it. Chatting last week to my MSP counterpart, Alex Johnstone, it was noticeable how much he talked of representing the "North East". As an English "North East" MP I think we will have a lot in common, ranging from concerns about fuel prices, to the need to stimulate both the rural economy and our core SMEs, and a desire to keep the union. On Tuesday I will be spending the day in North Perthshire meeting local councillors, local activists, local farmers and NFU reps and then have a meet with the Scottish Air Ambulance, in my capacity as chair of the All Party Group for Air Ambulances. Red Squirrel numbers in Northumberland are up! Full credit to all the local activists working to keep red squirrels alive. Like Railways, trains, engineering, endeavour, community spirit? Wylam was the place this Saturday. Yesterday was train central in Wylam. Dwarfed by the mighty Puffing Billy train we all enjoyed both the celebration of the first steam railway engine and so much more: hundreds visited the wonderful railway Museum in Wylam, saw the incredible Elaine Milbourne Dancers, watched the first perfomance of the new silent movie "Just in Time", and witnessed the modern day version of a Waggonway race as the Heddon and Wylam Brownies and Guides fought it out - this time using converted shopping trolleys. It was an amazing day and full credit to all the organisers, activists, Beamish Museum, supporters, local engineers and the sponsors: special praise to Tom Martin and the Wylam Parish Council, without whom this would not have happened. If you missed it do not despair: take a drive to Wylam and park your car by the river and walk the waggonway down to George Stephensons cottage. As you do time passes and you are back in tough days, and tough times, where the industrial revolution was formed. William Hedley was the man behind the Puffing Billy [his ancestors were there yesterday!] and his need to haul coal from Wylam Coliery to Lemington Staithes; but the story is linked by the Waggonway that takes you barely a half mile down to the one room in a small cottage where George Stephenson grew up. It is 12 foot by 12. His father, mother and 3 siblings lived there, on the site of the Wylam Waggonway. The hardship and struggle are palpable and humbling. In those days coal was king and life expectancy short. The Puffing Billy train was the transformative engineering breakthrough of its time but Stephenson took the dream and the change a further step. In those days the North East drove the economy of Britain and the coalfields of Wylam and the surrounding area drove that change. It has won dozens of awards and is a good place to consider what made this country great; and so much starts in Wylam. Yesterday Ed Miliband was asked in a Q and A when he would “bring back socialism”. He replied: “That’s what we are doing, Sir". - scrapping the “spare room subsidy” = a policy in the Labour 2010 manifesto, and a U turn on welfare reform which he previously accepted was part of the required need to cut the nations welfare bill. - ending zero hours contracts = a policy that his own council in Doncaster uses, as do local authorities up and down the country. A policy that many locals here in Northumberland have made clear they support. - opposing the privatisation of Royal Mail = Labour party policy pre 2010, and the only way Royal Mail will survive. Primary School Plans: these I find fascinating and bizarre even from Ed. He also announced plans under which primary schools would be forced by law to look after pupils from 8am until 6pm. How would this be costed? He said it “doesn’t make sense in this century” that some schools still close in the midafternoon, when both parents more often work. The primary and first school teachers I know who do a fantastic job in Northumberland would have a word or two to say about that plan. Aside from all these things these are yet more spending commitments by a man without a clue about balancing the books. Its not too late to enter! The UKCE route planning team described the Wiggle as "the best cycling they have seen in the whole UK. Epic ...deserted...magnificent vistas ....The one the whole team wants to cycle...."
Last Saturday I popped in to the Cafe / restaurant that is set up in the old station at Langley. It is clearly doing very well. I discussed their progress and they made the point that they had successfully used the Groupon Voucher System as a way of marketing; in their words: "it was amazing how much repeat business and new business it generated." I would advise other start up businesses to look at this - www.groupon.co.uk and pick your town and see what comes up. I am not recommending them but they can clearly be a good help for start ups in particular. The garden station are doing well, and are having a vintage fayre on the 19th October, Christmas Fair on 16th November, and are beginning to have weddings, as they are registered to do so. "We have and still are working very hard getting our name out there and it is constant. You always have to be marketing and thinking of new ways of bringing business in. We don't think of ourselves suffering from the recession, we continuously work hard to keep our standards up and if you look at trip advisor, apart from one or two negative reports in the main we haven't done so bad considering we have only been here for 18 months." This week I have spoken to loads of businessmen and women who run everything from restaurants to a couple of farms, from a vets to a brewery. Add in a fishing equipment business, a physios, a large number number of micro SMEs, a couple of pubs and a number of cafes and I feel that is a good cross section. There is a definite feeling that we have turned a corner, albeit no one is taking anything for granted. Over 4 of the businesses spoke of bank finance problems, and inflexible / unreasonable bank managers. My overall impression is that the businesses themselves have a new confidence and some were genuinely positive. Several like the Allendale Brewery and one of the farmers spoke of significantly enhanced sales due to diversification. For my part you know there is a recovery underway when the critics of the economic strategy change their tune from saying “austerity cannot work” and “there will not be a recovery in growth or jobs” [The Ed Balls argument]. Instead the critics now argue the government is complacent for daring to say a recovery has started, complain that living standards are not yet rising after a 5 year long period and suggest at the same time there is a housing asset bubble [Ed Balls again]. So what is happening? There is a large increase in private sector jobs, apprenticeships, and unemployment has fallen, albeit the private sector growth here in the north east - whilst still very good - is behind the south east. For the reasons for this see the Adonis Report in detail. Output is now expanding, probably at the fastest rate of the major economies. The government has been careful in how it has described this, and is far from complacent about the state of the UK economy. They stress the need to do more to raise living standards, to curb the debt and spread the growth more widely. But 1.4 million new private sector jobs is a great achievement by small businesses up and down the country. military escalation has also helped by lowering the oil price. More needs to be done to make energy cheaper, to lower tax on working families and to stimulate more competition and cheaper prices but the evidence of a change is there. -and creating a climate for more jobs are all helping with living standards. It is difficult to accept the claim that we have a housing bubble in the UK. The housing market in many parts of the country still shows prices well below the 2007 peak. Transaction volume has been much lower than during the 2005-7 bubble. London is very different to the rest of the country on housing. Certainly, in the north east we do not see any such bubble. The market generally is far from overheated. Many of you will know I have been campaigning for free parking in Hexham. Free Parking is one of the key points in my ten point plan which I have pledged to try and deliver for Hexham. Hexham's three Conservative County Councillors and their town council colleagues on Hexham Town Council were also elected on this pledge. At County Hall both Labour and the Conservatives are united on the benefits of free parking. I know that some residents think its a luxury we can't afford, but its actually something we desperately need if we want to save our small shops and boost our town centre. Market towns like Hexham and their outlying rural communities are hit particularly hard by aggressively controlled parking charges. I believe free and easy access to the town centre is essential to keep towns like ours alive in the long term and that is why I am urging us to drop the charges and see what benefits it brings. Put simply, why would you pay to park in the town centre when Tescos is providing free parking? That is one of the key battles the traders face - and it's one we can do something about. I am the first to tell anyone who will listen how beautiful our historic town is. Yet the economic reality is that we must strain every sinew to help our local shops compete if we want them to stay in business and maintain a vibrant town centre. Parking charges may seem insignificant to some people but the free parking at Christmas last year saw trade boosted by 5-10%. If you are a small retailer trying to make ends meet that can make all the difference. Hexham is a wonderful place to shop but our independent retailers and local shops need every little bit of help they can get. Also, time controlled parking will boost trade in our town centre and give our small shops a chance to compete with Tescos and the Metrocentre. The fact is that 60% of people have driven to an out of town shopping centre simply because parking is easier according to the FSB. We have have got to make it as easy as possible for people to support our locals and help keep our town centre alive. Free parking is a key way of doing that. The fate of Hexham's car parking charges is to be decided by Hexham Town Council in the coming weeks in consultation with County Hall. It is quite right this is a decision to be taken by the Town Council, and they know my position. I am an advocate of free parking because I believe it will help our small shops and I am determined to fight to keep our town centre vibrant. I make no bones about setting out the argument for free parking. I believe it is what is best for our town and I will fight for it every step of the way. Interesting feedback, including the comment below, but many constituents make the case that this problem is not resolved. It helps that the trains are alcohol free, but the issue is why the police in Newcastle are letting some people well under the influence to get on these trains, if the BTP are getting off at Hexham, which they are. Labels: BTP, Match Day Trains, Northern Rail, Northumbria Police. Congratulations to the other commended local towns and villages like Bellingham, Hexham, Corbridge and Knarsdale. A huge effort by so many local people who are a real credit to their communities. Should we change the law on assisted suicide? We do not let animals suffer, so why do we let humans suffer? Those with a terminal illness should have the right to end their own life and those who assist them should not face prosecution. Launched Monday it is now much easier to move banks. Speaking for myself I intend to move banks soon. However, I am waiting on the day when we will have a new local bank to the north east [I see little point moving for 9-12 months then moving again]. But anyone who wants to move can now do it in 7 days, and the move itself is much easier. Until then here are the ratings on all the banks. Fridays debate and my speech on the Citizenship for overseas nationals serving in our Armed Forces gave me a chance to set out thoughts on the military covenant, and address how we are looking after our troops both locally and abroad. The Citizenship [Armed Forces] Bill addresses a loophole, identified in the miltitary covenant, where soldiers are discriminated against. If a soldier, who is an overseas national, but serving in our Army, has been abroad serving in the 5 years prior to his application for British citizenship he cannot apply to be British, under the Nationality Act. This is being fixed by Jonathan Lord's Private Members Bill, which is supported by all the Army charities. The Bill is about two of the most important issues that we in the House of Commons debate—namely, the armed forces and immigration. Most of all, however, it is about justice and fairness, and that is surely what the armed forces covenant is all about. The covenant is not just a piece of paper; it is a priority for the Government. It is about fair treatment for our forces and about having an impact on the lives of the military personnel who serve in our communities. Its remit goes wider than that, however; it is about justice. The armed forces covenant is about an obligation on the whole of society. It involves voluntary, charitable and other bodies, as well as private organisations and it is about how all of us as individuals treat those who put their lives on the line for us. We all need to recognise that fact and to engage with it, so that we can implement the crucial elements of the covenant. I urge those who are in any doubt about the process that the Government have entered into to study the covenant itself and to work their way through its history. The covenant was established in May 2011, and it was based on the principles of removing disadvantage from serving personnel in relation to access to public and commercial services, and of allowing special provision in some circumstances for the injured and the bereaved. The Government committed to rebuilding the covenant and established an armed forces covenant taskforce in July 2010. The taskforce reported to the Government, and many of its recommendations have subsequently been implemented. It produced two reports. The size of the second report—the “Armed forces covenant annual report 2012”, which runs to almost 100 pages—is testimony to the seriousness with which the Government are addressing these issues. It contains details of the specific measures that we are taking. Significant achievements are to be found in many discrete areas of the covenant. Health care, for example, is a matter of prime importance for service personnel. Investment has been made in areas such as medical equipment in theatre and mental health care provision. Many of us have spoken in the House about the importance of providing support for our servicemen and women after they have been discharged from the Army, or when they are merely returning home on leave. I urge Members to visit Headley Court, the Defence Medical Rehabilitation Centre, which was opened with £17 million of assistance from the Government. A further £5 million is going towards wards and accommodation. Thanks to the armed forces covenant, there have also been developments in housing. Members of the armed forces are now being placed at the top of the priority list on the Government’s First Buy scheme. The armed forces covenant is why we are here today. The anomaly that the Bill seeks to address is that a serviceman or woman who serves overseas for a considerable length of time does not satisfy the requirements for naturalisation in the way that others are able to do. I speak with great relevance to my own constituency because I have the privilege of having Albemarle barracks in my Northumberland constituency. For many years, the troops based there have been the 39th Regiment the Royal Artillery. By reason of the basing review, they are moving down to Wiltshire. We shall therefore be welcoming in the near future the 3rd Regiment Royal Horse Artillery. Let me explain the relevance of this to the Bill. The 3rd Regiment RHA have been based at Caen barracks in Hohne, Germany. Many soldiers have spent a considerable period of time there—overseas. I do not know the exact number of individuals, but if that regiment has overseas servicemen working there who, by reason of the British Nationality Act 1981, do not qualify for citizenship, they would be exactly the sort of individuals who would benefit from the fact that this Government are addressing this particular anomaly. I speak as fifth generation immigrant—one with a lot more “Saxon” than “Anglo” in my name. It is certainly the case that anyone coming from 3rd Regiment RHA should be able to benefit when, as we all hope, the Bill of my hon. Friend Jonathan Lord, who has done great job bringing it before us, becomes law. I endorse entirely the support that various charities and Army organisations have expressed for the Bill and I welcome the fact that the Government have consulted them and got them involved. Like many others, I am a huge supporter of the Royal British Legion. I have raised funds for my local branch and it does a fantastic job. In addition, I welcome the fact that organisations such as Veterans Aid and the Army Families Federation have got involved and strongly supported my hon. Friend’s Bill. My hon. Friend makes a powerful case for the Bill. Is it not just as significant that, as far as we are aware, no organisations are hostile to the Bill, just as all the military charities are in favour of it? That is the case. We need to recognise that there is a rich tradition of this country working with overseas soldiers in pursuit of the aims and objectives of the Queen and this country. One needs to think only of the battle of Britain. The Spitfire was not manned to the greatest degree by Anglo-Saxon men and women, as there were 145 pilots from Poland, 135 from New Zealand, 112 from Canada and 88 from Czechoslovakia; 41 were Irish and there were 32 Australians, 28 Belgians, 25 South Africans, 13 French, 11 Americans and one each from Sri Lanka, Jamaica and Zimbabwe. An interesting point that dovetails into our consideration of this Bill is that Jamaica will be particularly affected because its citizens continue to support and serve in our armed services to this day. We appreciate the fact that the Bill is amending just one small part of the armed forces covenant, but it is certainly something that we should all support. As I reflect on the fact that there appears to be no opposition to the Bill and full support for it from a whole range of organisations, it makes me glad to be participating in private Members’ Bill proceedings for what I believe is the third time—I have a rich history over three years and three months with the Mobile Homes Bill and the Antarctic Bill, both of which I am pleased to say became law. I am very pleased to support my hon. Friend the Member for Woking on his Bill; he has done a fantastic job. An ideological contest is taking place, as described by many commentators who are in Glasgow at the Lib Dem conference. It will determine if they get in to a coalition with Labour or the Conservatives post 2015 if there is no majority government. The classical liberal approach began with the publication of the Orange Book essays in 2004 and was boosted by the coalition agreement with the Conservatives in 2010. In this corner are David Laws, Duncan Hames, and therir leader Nick Clegg. Alison Goldsworthy calls on the state to go on "a progressive diet" slashing welfare payments to the rich including Child Benefit and the Winter Fuel Allowance. Lib Dem MP Stephen Lloyd urges his Party to back the Work Programme and a further emphasis on reducing benefit dependency and to present this in positive terms. In the opposing camp are the Social Liberal Forum, who favour state control over market involvement. This is the faction for the egalitarian, social democrats led by Shirley Williams, Vince Cable, Tim Farron and others. They like to talk a lot about William Beveridge implying (surely falsely) that he would resist scaling back of the welfare state from the extraordinary size it has reached. Their council includes the Lib Dem MPs Julian Huppert, Adrian Sanders, John Pugh and Andrew George. They argue for more spending stating that only a "significant departure" from the spending cuts being undertaken would allow growth to return. Another paper they produced declared that "competition as a driver for school improvement" was being pursued "through costly structural changes to schools in England." The paper said there was no evidence it would have "impact on overall pupil attainment...Yet competition can increase stakeholder anxiety, impact negatively on teacher morale and pit school against school." As the ideologists continue the argument the disadvantage for the SLF crowd is that events are proving them wrong. The policies they opposed are ones that have produced achievements for the coalition government of which their party is a member of. The spirit of William Gladstone and Jo Grimond is being revived. Watching Paddy Ashdown with Andrew Neil last Sunday was instructive. He was adamant that the Liberal Democrats are a ‘left-wing party’. There is no question he is a Labour leaning Liberal. Busy week ahead with surgeries, visits to several businesses, including the Allendale Brewery, a ton of letters to respond to and plans aplenty for the winter months to be sorted. Trying to go to the Children in Need meeting on Wednesday evening, and if I can get free, hoping to go to the Prudhoe Comunity Partnership AGM on Tuesday evening. Also much looking forward to spending the day in Wylam on Saturday at the Puffing Billy Festival showcasing the pioneers of the railways from 200 years ago. Please come down and support and also visit George Stephensons cottage just next door. Today I spent 4 hours walking the countryside that makes up the Green Belt around Ponteland, studying what you can only see on foot. The stormy weather that had hit us so hard during the day abated to produce a sunlit windswept autumnal day; hikers, dog walkers, parents with kids and cyclists shrugged at each other as if to say - this is what we like when autumn comes. Aside from the green lungs that is the wonder of Ponteland Park it was a delight to wander the footpaths and bridleways that surround this community. I met many locals: like the Ponteland man, who works as a headteacher in a school in Newcastle. We walked the footpath back into town between the High School and the proposed site of the Banks developement. He described to me how when he returns from work in Newcastle every day the sight of the green fields on the outskits of his home town fills him with comfort and a sense of peace. It is this desire to prevent an urban sprawl, and an acknowledgement of the need to protect the green spaces around our town, that motivates the local campaigners who oppose the Banks and Lugano developments. In barely a month we will know our fate when Northumberland County Council produces its local developmeent plan, which includes the review of the green belt around Ponteland. 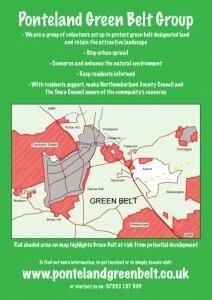 It is our fervent wish that this green belt is protected. This is not to say that we, or I, am against development of appropriate housing. I have backed wholeheartedly the housing plans at the old Ponteland Pollice Headquarters site, which will provide hundreds of homes, and again campaigned for the several hundred more homes being built to a very high standard by Bellway, as we speak, at the Stannington Hospital site. This will more than adequately accomodate local needs. Every councillor, member of parliamnent and community activist knows that you only discover a place by walking the ground. By seeing things that are not there when we whizz by in a car. I discovered a lot today. Taking in the delights of the footpaths and cycleways, of byways like Fox Covert Lane and the old Railway you are seeing things that are not possible after overdevelopment. As I walked the hedgerows abundant with rosehips, wildflowers, and ageing blackberries I and my fellow travellers were in no doubt that the green belt is worth the struggle, worth the contest with the big beasts that are the huge developers at Lugano and Banks, and fervent in our hope that the Northumberland County Council see things the same way when the decision is made in October. My thanks to all the team of locals who have given up their time to help at http://www.pontelandgreenbelt.co.uk/ponteland-greenbelt-group/ and to all the locals who have put up their signs in their gardens and hedgerows. There has never been a local campaign like this - or not for four years at least - when we last pulled out all the stops to beat O2 mobile phone Company, who wanted to put a phone mast by the Darras Hall First School. They said that campaign was impossible to win as well! I am a passionate unionist both because I believe we are better together, based on history, shared triumphs and so much more, but also because I believe my constituents in Northumberland would suffer economically if Scotland were to go independent. This impact on the rural economy was highlighted in Saturdays Journal front page and the exchange of questions I had with Scottish Minister Michael Moore last Wednesday in the House of Commons. "What would be the impact on the rural economy of my neighbours in southern Scotland if Scotland went independent and we had a border with Scotland?" "As one of my hon. Friend’s neighbouring MPs, I recognise the importance of Hexham and north Northumberland. As he knows, in a farming context and in so many other ways, any kind of legal border between Scotland and England would be an absolute disaster—not just for our constituents, but for all the United Kingdom." I am heading north next weekend to help the Scottish Conservatives in a number of seats but also to make the case to the Scots I meet that England wants Scotland to remain part of the Union. I am going at the start of one of the most crucial years in Scottish electoral history. I am speaking at events in Aberdeen on Monday 23rd September, North Perthshire on Tuesday 24th, then near Loch Lomond on Wednesday, and then finishing in southern Scotland in David Mundell's patch for a dinner on Thursday 26th, before driving south to Hexham later that night. Along the way I will be going to many events, meeting all sorts of people, campaigning with Young Conservatives and local councillors and campaigners, knocking on doors and listening to what voters have got to say on a multitude of issues. Most importantly I will be listening to what the Scots have to say, and giving the view of an MP whose constituency borders Scotland at Carter Bar, and whose voters are concerned by Scotlands possibility of independence. This is with a background of the key by election next month in Dunfermline following the resignation of Bill Walker, who won it for the SNP by 630 votes from Labour in 2011. This will be a good yardstick of where the debate is at. It is a seat that Labour should win. The consequences for the Labour leadership and, by extension, the No campaign are significant if they can't take a seat occupied for two years by a man standing down afer a conviction for over 20 criminal counts. It will also impact not only on the Scottish referendum, but also Ed Milibands prospects in 2015. A busy day yesterday covering many miles across the constituency, but broken up by visits to many of the wonderful Northumbrian churches that were open as part of the Historic Churches Steeplechase. My thanks to all the parishioners and vicars who welcomed me and chatted to me. It was a pleasure to meet the vicar at Wylam at last, and a delight to have a good look round the beautiful Hexham Trinity Methodist Church, which prayed for me and sent me a scarf (that I still wear) when I was unwell. Then, after popping by the Hexham Abbey, and in to the Salvation Army in Hexham to speak to the ladies in there about everything from the food bank to their work in the community, it was off west to Ninebanks. There I had been invited by Roger Morris and parishioners to be at the opening of the Ninebanks Heritage Centre. Tea was laid on and over 50 locals, tourists and hikers came to the Village Hall to hear Roger talk about the work of Isaac Holden, and listen to me say a few words of thanks and appreciation. Roger gave us a historical tour of St Marks church in Ninebanks, the graveyard and the village, but not before him mentioning to the vast crowd of 50 that the last politican to address a crowd at Ninebanks had been my predecessor as MP for West Northumberland, Wentworth Blackett Beaumont, who came, with his wife, to Ninebanks to open the school he had built on July 18th 1856. A crowd of 3000 attended, serenaded by the West Allendale Brass Band, and all were provided with tea and cakes! Roger kindly noted that politicians don't attract the crowd they used to! None the less the Heritage Centre in Ninebanks is superb, with exhibitions on Isaac Holden, the Tea Trail and so much more. The cakes were also delicious. I spent some time there chatting to locals, tourists and hikers taking abreak from the Tea Trail. This walk and the Coast to Coast cycle way are doing so much to revitalise the economy in our most rural part of south west Northumberland. 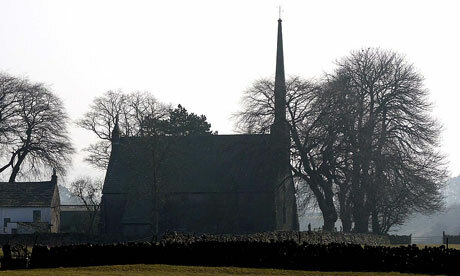 The church itself at Ninebanks is simple but beautiful. I then travelled on to visit the Holy Paraclete Church in Kirkhaugh. I have wanted to visit this church for many reasons for some time. Firstly, it is exceptionally beautiful and a architectural masterpiece, but also its name is unique. Designed by its first vicar, the amateur architect the Reverend Octavius James, and built in 1849 on a medieval sacred site, the church is unique in England in being dedicated to the Holy Paraclete, the Holy Spirit symbolised as a dove. Its quirky architecture is topped with a toothpick spire modelled on churches that James admired while travelling in the Black Forest; its appearance has attracted mixed reviews. The architectural historian Nicholas Pevsner described it as "absurdly thin", but in its heyday it would have been a devotional landmark for about 250 parishioners, scattered around mines and farmsteads. Now the congregation is small except when weddings are held, taking advantage of Kirkhaugh station, just a field and a footbridge away, to ferry guests from Alston via picturesque steam trains on the South Tynedale narrow gauge railway. There are beautiful pictures of past weddings in the back of the church. The spire makes Salisbury Cathedrals thin stem look extravagant and large! It is a stunning piece of architecture and the church itself in side is beautiful. The commemoration of the 1st world war was notable for the 7 members of the Maughan family who fought - with 2 sadly losing their lives. It is worth noting that the wonderful Helen Maughan, who lives over the hill in Whitfield, has just retired as the Matron of Hexham Hospital this week, after 40 years of service for the local NHS. She will be sorely missed by one and all. She was an outstanding Matron in an outstanding hospital. I do not know if she is related to her 7 relatives who fought in the war, but I would guess for sure. As I drove back to Hexham for my final surgeries last night I pondered on the unique people that make west and south Northumberland so strong. There is a sense of community here that is impossible to underestimate, and a tie to the land from which their forebears came. The Maughans and Beaumonts are still here. Long may that last. There is also Ovington Village Fete at 2, Acomb Floral Show 4.30, a leek show at the Fox and Hounds in Wylam and an open day at the Hearth in Horsley this weekend amongst many events. This years Northumberland County Show was a great success. However, everyone will be aware that there were some traffic issues at the new site and I'm pleased to report on the work being done to fix them. Most importantly of all, the road by Stocksfield Station has been repaired and will of course be open for next years show which it wasn't this year. Improvements will be also be made to signage for traffic, including the use of variable message signs to keep people updated. I will be in touch with the County Council and show organises to see how things progress. I am particularly keen that the shuttle bus is made to work, as this is vital for disabled people accessing the show via public transport. Full credit to the Show team and the Highways Department at NCC. Pleased to see the appointment of a specialist building contractor to begin work on the Abbeys £3.2m restoration project. The restoration of the Abbey’s medieval monastery buildings will reunite the Abbey site for the first time in 500 years, following the removal of the monastery complex from the Church by Henry VIII in 1537. Building work by York-based restoration specialist William Anelay is due to begin within the month. The ambitious project to redevelop the 13th Century monastery is a landmark in the Abbey’s 1,339-year history. It will be funded by a £1.8m grant from the Heritage Lottery Fund and funds raised by the congregation, the community and on-going applications to various grant-making trusts. The Abbey was founded in 674 AD by St Wilfrid. It is home to many internationally renowned items including an original Saxon crypt which is thought to be one of only two intact Saxon buildings of its type in the world. The monastic buildings which adjoin the Abbey were taken over by Henry VIII in 1537. They then passed through various owners before being sold to the local authority, which gifted the buildings back to the Abbey as part of the project in 2012. Full credit to the NCC for their actions. • Permanent meeting spaces for both religious and secular groups. • A large space for community activities, celebrations and events, including wedding receptions. • Exhibition spaces to display the Abbey’s historic treasures. • Interpretation spaces to tell the Abbey’s long and fascinating history. • Educational areas where people of all ages can study the significance of the Abbey in more detail and explore contemporary social issues. • Outdoor spaces where children can play and performances can be given. • A herb garden and place for quiet reflection. • Quiet areas for private study and contemplation. If you have not visited, walked around or worshipped in this wonderful building I urge you to do so. 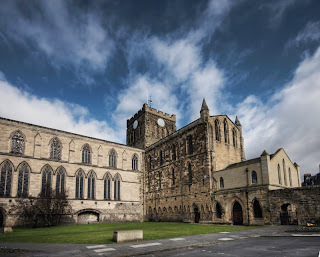 It is the jewel in Hexham's crown and a place for contemplation and so much more. In the afternoon I am driving down to open the Heritage Open Day event at Ninebanks church, where I will have the chance to meet lots of the locals, discuss the tourism changes brought about by the Coast to Coast Cycle path and, in particular, the Isaac's Tea Trail, and visit Ninebanks church. Please come down if you are about. Later on I have further meetings back in Hexham. If I have the energy I am due to go to a party tomorrow night near Housesteads. Bit worried as it is Fancy Dress, and I will still be looking like an MP on a weekend at 7 oclock! Lauren Langton and I met the key Ministers on Wednesday and I have high hopes of an innovative scheme to help credit unions assist oil clubs and the low paid / elderly with funding to deal with heating oil purchases. More details to follow but anyone interested should contact Lauren direct and forward the code of practice to all interested oil buying clubs. Today the PM welcomed the team behind the local business Baggers Originals kids wear to Number 10 Downing Street. 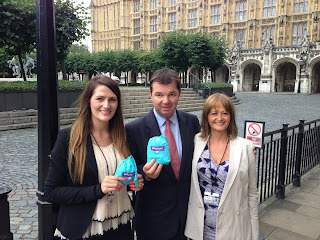 Jessica McLean and her mum are the dream team behind Baggers, and I showed them round the House of Commons this afternoon. They are from just outside Ponteland. The PM asked them to todays reception becuase theirs was one of the local businesses which have benefited from a start-up loan from the Coalition Government. Many entrepreneurs were invited and the team from Baggers were able to network, showcase their product at the reception, chat to the PM and give him a selection of their childrens clothing for his kids. Baggers originals are kids clothes and outdoor wear that is simply unique, and squash down to almost nothing. I was certainly very impressed! The start up loan was used to set up the business website in particular. This is part of the drive to support British Business and the government loans do make a huge difference. In May 2013, I, and my two fellow County Councillors, were elected on a pledge to campaign for free time controlled parking in our town to put an end to the parking charges disparity across our County. Free parking was also pledged by Labour candidates in their local manifesto. Subsequently Hexham Town Council agreed to 'convince Northumberland County Council to implement free, time controlled, parking which will boost trade in the town centre' as part of our interim action plan. We were supported on this resolution by our local MP Guy Opperman. Since then we have been very keen to negotiate the right parking deal for Hexham with the County Council as quickly as possible. I ask the Labour administration at County Hall and the Labour members of Hexham Town Council to stick to their manifesto commitment, and to get on with the job in hand and help us boost trade in our town centre rather than playing politics. This Friday I am looking forward to helping to guide a Private Members Bill through the House. I have only once done a full Friday session before on the Park Homes Bill, although I also did help on the Antartic Bill. This Bill is short but addresses a specific problem - namely the disadvantage faced by members of HM Forces, who are not British born, but who were overseas on the date five years before their application for citizenship. It is not right that they should have their applications refused when the very reason for their absence was that we had sent them overseas to protect our country. My boss, Mark Harper MP is responsible for the Bill and is very supportive of what was a priority commitment under the Armed Forces Covenant. This Bill which will ensure service men and women are not disadvantaged and allows the Secretary of State to waive the requirement, in Armed Forces cases, for the applicant to have been in the UK on the date 5 years before an application for naturalisation. This requirement could disadvantage a member of HM Forces who was on an overseas posting at the relevant time. Myself and Sir Alan Beith welcomed 8 Young Northumberland constituents to the House of Commons yesterday. After a tour of the House of Commons and Lords, Alan and I answered questions on the terrace before getting them tickets to Treasury questions, and the A and E statement in the Commons. Really good to meet them. In 9 weeks Pudsey will be coming to Hexham! What special something funny are you planning to do to raise money? For my part our plans are coming along nicely. The house is not sitting that Friday so I am keen to go all in and try andrally make children in need a great Hexham fundraising day. Details to follow. The number of refugees has now exceeded 2 million, half of them children. While in St Petersburg at the G20 the Prime Minister announced that the UK will provide £52 million in new humanitarian funding. This brings the UK’s total funding to £400 million, double the £200 million of the UK’s largest previous response to a humanitarian crisis. The Prime Minister has called for a strong and united push from G20 leaders for safe, unimpeded access for humanitarian workers inside Syria, including safe routes for aid convoys and the lifting of bureaucratic hurdles imposed by the regime. This would ensure aid agencies can deliver life-saving help when and where it is needed. For full details see here. For my part I am proud that the UK is at the forefront of the humanitarian response. We are the 2nd largest humanitarian donor to Syria crisis relief after the US. A year ago there were 230k refugees from Syria. Now it is over 2 million and rising. The UK is providing food for over 285,000 people every month, clean water for almost 1m people, and over 300,000 relief items like blankets. Lebanon, a country of 4 million, will soon host 1million Syrian refugees. The Syrian regime is still obstructing humanitarian operations, which must stop. The UK continues to call on all parties to allow humanitarian access. Like everyone I would welcome a resolution to the chemical weapon problem, albeit I would struggle to trust the Russians as monitors of any process of detention of weapons. But the proof will be in the pudding - this idea of giving up chemical weapons has been sought for some time with no response by Assad. However, I do regard these last few days as progress. Met with the Chancelor this evening and listened to his detailed report on the economy. We discussed everything from the fuel price freeze, which we urged him to continue [compare with the 10+ price hikes under Labour], taking low paid out of tax [compare with Gordon Brown and the 10p tax], creating over a million private sector jobs [on any measure more in employment as compared to the Labour years], keeping mortgage rates down, reducing the deficit and getting more apprentices coming through [mine have doubled in my area of the North East]. Yet we also discussed the possible clouds on the horizon which could be European or Middle Eastern instability, or destabilisation in the emerging markets. For now the Eurozone continues its recovery, and the Brisitsh economy is healing and growing. One thing is clear. I listened to Ed Balls today and his policy of borrowing more and spending more would be disastrous. Not just my view but the view of every independent commentator. "Some people may think that the G20 was the important political event of the week but for us in Derbyshire its the Erewash Jobs Fair on Thursday that counts." "Turning it round means changing our banking system. So we would have a new British Investment Bank to get finance to small businesses. Banks that are legally obliged to invest in their region of the country and their region alone." Last Thursday I debated the Adonis report. The Labour spokesman was Iain Wright, normally a perfectly normal individual. On Thursday he was on another planet and said not a word about the Adonis Report, and seemed to be at another debate. He seemed not to understand the Report's recommendation on a Business Bank, and refused to endorse community regional banks, or answer why he and his colleagues had voted against them in April 2012 in the House of Commons - with Ed. Does the hon. Gentleman at least accept the report’s recommendations on the business bank? Specifically, does he now accept—he did not when he voted against them in April 2012—that community banks are the way forward for the north-east? Businesses do not have confidence that the Government’s business bank is having any impact whatsoever. It is slow off the mark—[Interruption.] If the hon. Gentleman would stop chuntering and allow me to speak, I will respond to his question. The business bank is not working. And on he went about matters neither to do with the Report, nor my question. The debates I have had with the Labour front bench are legion on this issue. They cannot reconcile their support for regional banks yet every time it comes to a House of Commons vote they vote against them. I would welcome a Damascene conversion, but I will believe it when I see it. On the economy, the Prime Minister spoke of repairing our broken banking system. Does he agree that the creation and expansion of regional and local banks are key reforms of this Government that will provide finance for small and medium-sized enterprises, address payday lending problems, and reinvigorate local community banking? My hon. Friend is absolutely right. As well as looking at the big banks and how we nurse them back to health—some good progress has been made there—we also need to encourage what are called “challenger” banks, and new lenders into the British economy. Those can be crowdsource funders as well as new start-up banks, or businesses such as supermarkets that are getting into banking. We should be encouraging all those things for a more competitive sector. Whilst Ed is talking, we are doing actual regional banking reform. I am pleased that Ed is now on board. He should talk to his team who are clearly not singing from the same hymn sheet. A fascinating day. I met and talked in particular with such diverse figures as Lord Adonis, Ed Twiddy, head of the LEP, Heidi Mottram, of Northumberland Water, Beth Farhat, the leader of the northern TUC (more to follow of that constructive meeting), Grant Davey, the leader of Northumberland County Council, and his chief executive, Steve Stewart, (again a very constructive meeting) plus various schools leaders, bus providers and transport enthusiasts. The morning featured a panel discussion and much discussion as to the report. I found no one who was not supportive. I was on a panel in the afternoon discussing how we get bank, private and public finance in the north east and taking questions from amongst others a church leader, labour politician (Helen goodman came to the breakout session I was on the panel of), and the deputy leader of the south Tyneside council, as well as many more. There was a real sense that most of the North East politicians and business leaders are singing from the same hymn sheet, accepting of the need to think and act differently and broadly optimistic for the future of our region. No one is underestimating the task that lies ahead and clearly we live in difficult economic times but this report is the blueprint for regional development, jobs and growth. It's authors should be thanked long and hard for their efforts on behalf of our region. For my part I will be doing all I can to ensure that the report becomes reality. Education Questions today and seeing Minister, Liz Truss, this week - will make sure to thank here for her support for the Haltwhistle Academy decision. Later today, and tomorrow morning, I am meeting constituents who are coming down to parliament. All this week we are tidying up the Lobbying Bill in committee; it is a Bill whose principles are very good, but it needs clarification and that is what we do in committee and report stage of bills. I am also this week doing a second women to win selection night, trying to attend the Breast Cancer Awareness and Dementia receptions and also doing work on everything from Equitable Life to the continuing discussions about Rail in the North. On Friday parliament has a Private Members Bill day. Normally I am in the constituency on Fridays but as I am a PPS I am spending more time doing PMBs now, which is fascinating. Will blog more about it later in the week. The PM tells the Russians a bit about "our small island". This is great stuff! The question that this debate is making patently clear is whether it is the responsibility of the state to look after those who cannot look after themselves. It has also been made patently clear in the brilliant opening speech of the hon. Member for Islwyn (Chris Evans) and in other contributions that there are many different practical and relatively immediate measures that could be introduced to address the problem of high-cost credit. They include restricting advertising budgets, implementing a greater degree of financial education, doing more work on shared data, addressing the question of interest rates and improving debt advice. I endorse the comments of the Public Accounts Committee and urge the Financial Conduct Authority to do more, as requested. I believe that everyone agrees that the Archbishop of Canterbury was right when, in July, he championed the cause of credit unions and criticised the payday loan companies. He was right to say that we needed to “compete” the payday lenders out of the market. I welcome his comments, but I would argue that this debate has shown that although we all support credit unions, they are not necessarily the mechanism by which we will succeed in competing the payday lenders out of the market. There is cross-party agreement on specific measures that can be taken to address the problem of high-cost credit, but I suggest that the mechanism by which people ought ultimately to borrow on a long-term basis is local community banks. They have all the flexibility, the clout and the borrowing power of a bank, as well as all the sympathetic community approach of a credit union, and the amalgamation of all those qualities will produce the best way forward. My hon. Friend will be aware of the resurrection of TSB as a brand in a market in which it previously had a good reputation for providing small loans and deposits to people in local communities. Does he see this as offering opportunities in that space? I held a conference in Gateshead only a few months ago. It was attended by 170 delegates who were trying to set up local community organisations to address the lack of lending in their communities. They wanted to enable such lending by local, trusted providers, rather than by nameless, faceless, computer-led organisations based in London, Frankfurt or wherever. The smaller providers such as the TSB, the Hampshire bank and the Cambridge and Counties bank that are beginning to be set up are clearly the way forward. No one should dispute that the expansion of credit unions is an extremely good thing. I welcome the changes in the way in which they are to be run; the Government should take credit for that. All Members of Parliament should become greatly involved in their credit union; I certainly support the Hexham credit union, which was set up with the help of the Churches in Northumberland. However, I question whether the credit unions alone will be able to address the problems of high-cost credit. In regard to interest rates, credit unions have clearly adopted a fantastically successful approach—their lending rates are so much better—but their deficiencies might mean that it is difficult for them to go forward. None the less, debates such as these on Wonga or on the private Member’s Bill introduced by the hon. Member for Sheffield Central (Paul Blomfield) have substantially raised public awareness of credit unions in the House and in our local communities. I want briefly to talk about local community banks. For far too long, under successive Governments, we have been dominated by the big six or seven banks. I welcome the idea of a Church bank put forward by my hon. Friend the Member for Banbury (Sir Tony Baldry), but the kind of long-term community banking that he referred to has disappeared from our high streets and rural communities. That has had a detrimental effect on the ability to lend and to get credit. The Government have rightly addressed that problem. It used to be incredibly difficult to set up a bank. It took in excess of £50 million and the process was highly regulated, even though the smaller banks in question were in no way comparable to a Barclays-style bank. The Financial Services Act 2012 changed the approach taken by the then Financial Services Authority and its successor organisations involved in regulation, and I strongly support those changes. Reference has been made to the platforms required to set up a credit union or a community bank. Those requirements are now changing dramatically, to enable much greater interchangeability between pre-existing accounts held with the big seven banks and those held with credit unions or community banks. The mechanisms by which we can set up those organisations are improving, and many groups now wish to get involved. They include not only local communities but local authorities and individual businessmen with a philanthropic approach to their local community. Some universities, and even the Army, are considering getting involved. There are tremendous opportunities in our local areas to set up and expand these organisations. Over the coming winter, we will all be faced with the issue of the energy costs that our constituents will face. In my community in the north-east, we have 24% fuel poverty, and a large swathe of the community is totally reliant on either oil or liquefied petroleum gas. That is an unregulated market, with all the problems that that entails. We have now formed more than 14 separate oil-buying clubs to try to address the cost of the oil. However, the requirement to buy 500 litres involves a very large financial outlay, often when oil is at its most expensive, and we are looking at ways to address that. The credit unions are certainly being encouraged to be the providers in those circumstances. I hope that we will all try to expand our credit unions, using the vast plethora of good advice on regulatory changes, and to support our constituents who need assistance on this issue. For my part I am hoping to meet the Hexham Credit Union shortly when the House rises to see what I can do to help them expand and do what the Archbishop Justin Welby said he wanted to do - "to compete the pay day lenders out of business"
Long day but prepping speeches on two debates tomorrow. First up is high cost credit at around noon and then Adonis at around 2.30. Was also delighted to supervise the Women to Win mock selections tonight - a great performance by 6 superb women who will all be brilliant MPs someday soon. Who knew, ladies and gentlemen, that this debate was sponsored by the Dutch tourism board? Many of us seem to have taken a Dutch cycling holiday. I am here to stand up for cycling in Northumberland, which features everything from Hadrian’s cycleway and the coast-to-coast tour to the delights of Kielder and the castles cycle route. I congratulate wholeheartedly the cross-party group, which has done a fantastic job—this is probably one of the finest Back-Bench debates that we have ever had. My hon. Friend Dr Huppert, Ian Austin, my hon. Friend Dr Wollaston and other members of the all-party parliamentary group have done a brilliant job and produced a fantastic report. I need to declare the fact that I cycle to work in London. I can cycle from Fulham, where I live, to King’s Cross, pretty much all on a cycleway. It is much quicker than going by car. In Northumberland, I live near Stamfordham, where we see more bicycles than cars travelling around and about. There is no question but that the Northumberland economy depends to a large degree on cycling tourism and the economic benefit that it brings. I therefore support the motion wholeheartedly, but while cities such as Newcastle have benefited from over £5 million, the benefit to some rural areas, whether Northumberland or other counties, is significantly less. We need equality of funding across all parts of the country so that we may all benefit, rather than simply the towns that have been allocated money thus far. Like the hon. Gentleman, I welcome the report to get Britain cycling. He is right about rural areas. Does he agree that we need innovative solutions to help to provide opportunities to make it easier to cycle in rural areas, such as the two tunnels greenway in Bath, from which many of my constituents benefit, and the canal towpaths that run through my constituency? Otherwise, hedge-lined country roads between towns can be quite intimidating. “Other than a few parking stands, in Tynedale, there has been no cycling investment in the past 10 to 12 years." There are exceptions, but if we do not have innovative ways forward and local cycling champions we will struggle. I endorse earlier comments about the fact that we need individual Borises or cycling champions in some shape or form who champion cycling in their counties and regions. It is easy, given that Yorkshire has the benefit of the Tour de France next year, to make the case. Everyone in the north welcomes that. My hon. Friend has discussed the need for cycle routes in rural areas. We do not have the luxury of going along the embankment to create the Boris highway. We have to make sure that we have cycle routes such as old railway lines and so on that can be used successfully. We are working on precisely that on the Seaton to Colyford route. However, I very much welcome the debate so that we can have cycling in rural areas. Indeed. Not only that, but this debate is making converts. Our hon. Friend, the eminent colonel from Beckenham, has assured the House that he will get back on his bike, which I am confident is not a penny farthing. To the best of my memory, it has pneumatic tyres and a chain. The mind boggles: to know is to fear. Those of us who are students of the film industry will hark back to the comment, “If you build it, they will come.” That is the case in relation to cycling. It is easy for too many civil servants, Ministers of all types, local authorities, county and parish councils to think that investment in cycling is not worth the money, the effort, the criticism by drivers and pedestrians and the sheer difficulty of persuading people to get out of their beloved vehicles. However, if we build the type of facilities that we all require in our local areas, cycling improves. We need only look at the success of places such as Seville, as eloquently set out in the report, where between 2007 and 2010, cycling went up from 6,000 journeys to 60,000 journeys. We need only look at the changes in New York or Holland, sponsored as we are by the Dutch tourism board, where 27% of journeys are by bike, compared with 2% in this country. That is patently the result of investment, support and local champions. I suggest we look at the health benefits. Many have outlined the fact that we have an obesity crisis, and a great deal more work needs to be done on that. We should look at the benefits in terms of the cost of living, and we need to consider both the climate change and the tourism and economic benefits. I emphasise the need for local champions—not just the local larger champion of a county, but individual parish and county councillors who could make a difference locally. If we can start doing that and start working with health and wellbeing boards and the like, there is great potential to turn the topic from a fringe issue that we passionately debate to a mainstream way of life and way of travelling to work.